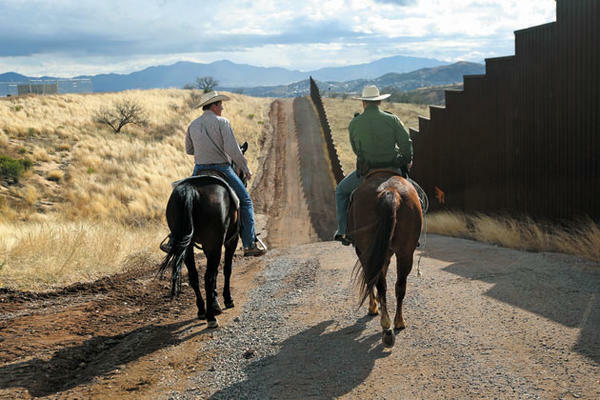 U.S. Border Patrol on the Mexican "frontier" in southern Arizona. Credit: John Moore/Getty Images.The myth of the frontier—that space, so the story goes, of both great danger and exciting opportunity beyond the sphere of control—is central to what many in the United States understand to be the country’s development. For Fredrick Jackson Turner, writing in 1893 about what came to be known as the "Frontier-" or "Turner Thesis," it was U.S. Americans’ encounters with new environments, their settling of the frontier, that explained the country’s dynamism and dedication to republican ideals of democracy and individual liberty. For critics such as historian Robert Drinnon, author of the classic Facing West: The Metaphysics of Indian-Hating and Empire-Building, Turner’s way of thinking made for a dangerous national creation myth, one that facilitated the dispossession of Native peoples while laying the groundwork for further conquest. While the globe-trotting Pentagon is perhaps the most obvious contemporary manifestation of this living myth, the U.S. Border Patrol embodies it as well, but with a focus on the “domestic” front. Though recent media has concentrated on the U.S.-Mexico border as the regional focus of the Border Patrol, Washington State is now one of the agency’s new frontiers in its never-ending quest to identify threats and purge them from the "homeland." An April 2012, report from the immigrant advocacy group OneAmerica and the University of Washington’s Center for Human Rights, documented a marked increase in Border Patrol surveillance and harassment of residents in northern Washington. 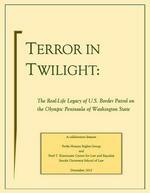 But a new report issued last month entitled "Terror in Twilight" sheds additional, concentrated light on the detrimental impact of the increased Border Patrol presence in the U.S.-Canada borderlands by focusing on Forks, Washington—known as the "Home of Twilight"—in the Olympic Peninsula. Of equal importance, it shows that the situation has improved of late because of local resistance. Produced by the Forks Human Rights Group and the Fred T. Korematsu Center for Law and Equality at the Seattle University School of Law, "Terror in Twilight" is based on a compilation of narratives of 251 different encounters between the Latino community in and around Forks, and the U.S. Border Patrol, between 2008 and 2012. Among the findings is what appears to be the Border Patrol’s frequent use of racial profiling—in violation of a residential executive order and Washington State law—for determining who to stop and question. Moreover, the report finds evidence to suggest that growing harassment of local residents reflects pressures on agents from “higher-ups” within the Border Patrol to produce arrests—especially in light of the relatively low level of cross-border activity in the region. The report establishes that the Department of Homeland Security has used a combination of incentives and mandates to increase the Border Patrol’s collaboration with other police agencies in the region. This has had the effect of blurring jurisdictional boundaries and increasing the distrust of law enforcement broadly, therefore decreasing the willingness of community members who are victims of accidents or crimes to turn to the police for assistance. Such factors, combined with a number of incidents of harassment, intimidation, and physically threatening behavior (aggressively tailing vehicles, for example) by Border Patrol agents, have led to heightened fear among the residents of Forks. Over the last year, the abuses by the Border Patrol have dropped dramatically as a result of administrative decrees won through community pressure, and most recently, a successful lawsuit by the ACLU and the Northwest Immigrant Rights Project against the local Border Patrol station. 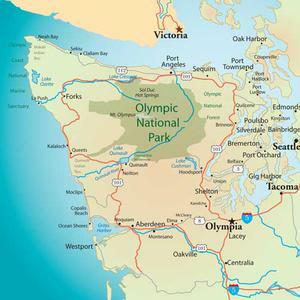 As a result of the settlement decision in September, the Border Patrol agreed that vehicle stops away from the U.S.-Canada boundary in the Olympic Peninsula must be based on reasonable suspicion of criminal activity. The Border Patrol also promised to give additional training in Fourth Amendment protections to its agents, and to provide reports to the plaintiffs’ attorneys documenting all traffic stops in the area for the 18 months following the settlement. Please support our independent reporting. Donate now! “We feel that a small sense of security and peace has returned to the community now that Border Patrol is being forced to follow the law,” said one resident quoted in "Terror in Twilight." The reining in of the Border Patrol in the region might help also explain, even if only a little, why deportations in the Pacific Northwest dropped 30 percent last year, a decrease three times larger than that which occurred nationally. 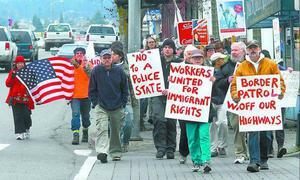 Port Angeles, Washington, 2008. Credit: www.popularresistance.org. What it definitely shows is the power of community organizing and resistance in the face of a largely unaccountable Border Patrol. Just as on the frontier of old, the expansion of the state into new areas, especially in terms of its policing and military functions, often leads to the harming of individuals, families, and communities—especially those already on the socio-economic and juridical margins. As geographer Alison Mountz reminds us, states, in the form of the apparatus of immigrant exclusion and boundary control, are mobile, too. They will go where they can—unless we organize to stop them.